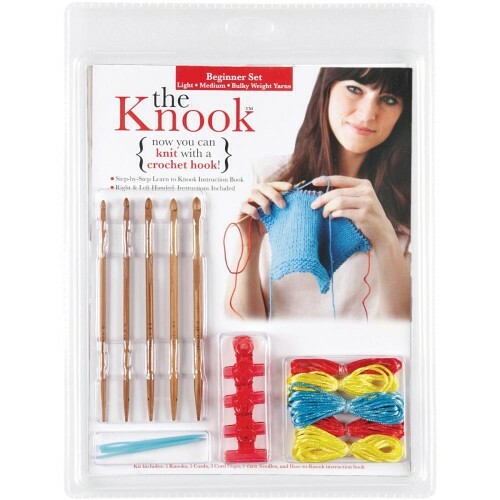 Create amazing knitted projects with the Knook! This kit includes five Knooks in different sizes, so you can work with light, medium, or bulky weight yarn. The five interchangeable cords are in graduated lengths to accommodate small, medium, or large projects, while the three handy cord clips completely prevent dropped stitches! You also get three yarn needles for finishing your projects! Clear instructions on the basic knooking technique will guide you through right-hand and left-hand stitching, while photos illustrate each step. Choose from three exciting patterns to make a lap robe, baby blanket, or cowl.